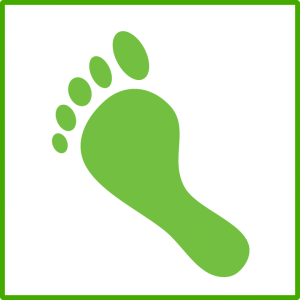 A carbon footprint refers to the amount of carbon dioxide produced by your day-to-day activities and the items you use. The most common greenhouse gas in the world is carbon dioxide. Produced by cars, manufacturing and other activities, carbon dioxide contributes to global warming. How Is a Carbon Footprint Created? Each person has a carbon footprint that is caused directly by the things that they do. Whenever you drive your car, carbon dioxide is released from the gas. When you heat up your home in the winter, you increase your carbon footprint. Depending on the source of your electricity, you may also create a larger carbon footprint whenever you turn on the lights. Other than direct sources of carbon dioxide, you also have an indirect footprint. This is caused by the things that you buy or use. Basically, the manufacturer increased carbon dioxide when they created or shipped the item. To reduce your impact on the environment, it is important to look for goods that have lower carbon footprints. Locally produced items and goods with reduced packaging can limit the amount of carbon dioxide released into the air. What Are Some Ways to Reduce Your Carbon Footprint? One of the first things that people think of when it comes to carbon dioxide is driving. Cars burn fossil fuels, so they contribute a large portion of your personal carbon footprint. Using a hybrid or electric car can limit the impact that you have on the environment. Likewise, taking public transportation, driving less or bicycling can lower the harm that you cause to the environment. At home, you can reduce your carbon footprint by using less energy. Energy Star appliances and light bulbs use less electricity. Likewise, there are water heaters available that heat water on demand instead of continuously running. Turning off the lights, unplugging electronics and reducing your heat consumption can all lower your impact on the environment. Older homes often lack the insulation necessary to stay adequately warm in the winter and cool in the summer. For these homes, new insulation can significantly improve energy efficiency. In addition to saving on your heating bill, the reduced energy usage also limits your carbon footprint. Living a sustainable lifestyle is good for the environment and can save homeowners money. To find out how new insulation and other options can reduce your carbon footprint, call USI today.